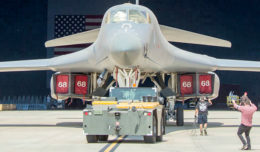 The 412th Force Support Squadron at Edwards Air Force Base, Calif., recently announced “Customer Appreciation Month,” slated for Sept. 1-30 at Edwards. Airmen and their families can win great prizes in a variety of ways at 412th FSS facilities. 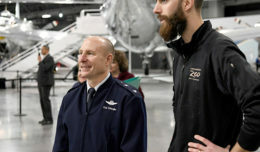 “We want to make you smile” is the theme of Customer Appreciation Month and during the month, Airmen and their families will have the chance to win more than $4,000 worth of FSS prizes. Several FSS activities will be hosting a designated Smile Day where customer counts will determine the winners for four different prizes, including a $100 FSS gift card. 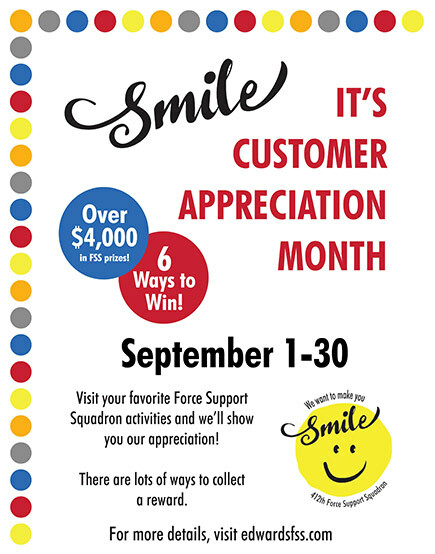 The 412th FSS will also activate a Prize Patrol to appear at locations across base throughout the month to randomly offer Customer Appreciation Month Swag Bags and $50 FSS gift cards. Additional program elements include Hidden Smile Cards, a Customer Satisfaction Survey and Facebook photo contest. For more information about Customer Appreciation Month or other FSS/MWR activities, visit the 412th FSS web page at www.edwardsfss.com or check out their Facebook page at https://www.facebook.com/EdwardsFSS/.